Gothic romance is one of those old genres that I wish were still popular. It's named after the pseudo-medieval buildings that tended to be a prominent feature of the settings, but that was hardly all there was to those tawdry novels. They eschewed realism and embraced sensationalism, ghosts and family secrets and more used to question fears about modern ethics and social order. Director Guillermo del Toro does a wonderful job of translating the genre into a modern movie. Set at the turn of the century and the end of the Victorian era, Crimson Peak raises questions of class difference, American versus English society, and feminine independence while still managing to focus on the important things: tormented ghosts, a creepy old house, psychosexual text, and a terrified heroine with surprising resolve. 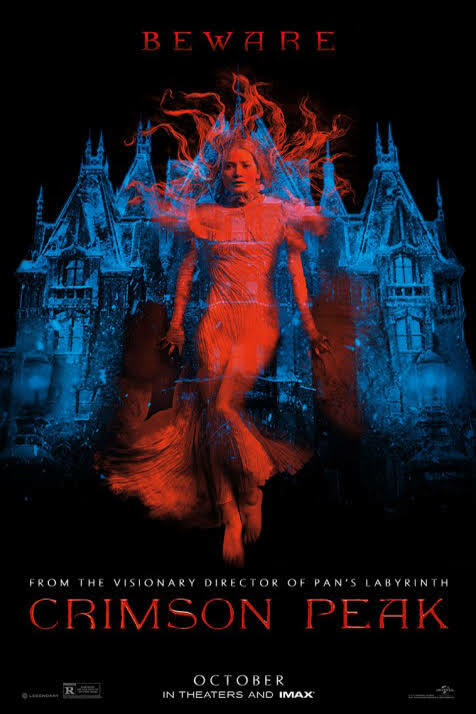 I think you should go see Crimson Peak on the big screen to experience the full beauty of the movie. The sets are amazing. The eponymous house is ridiculous, a stately manor fallen into disrepair since it was built on top of a clay mine. This is mostly an excuse to use the clay, a squishy red substance, everywhere. It sinks through the snow, like blood. It oozes through the first-floor floorboards and trails down the walls, like blood. It bubbles in vats in the basement, less like blood and more like something lurking beneath a catwalk in the origin story of a comic book villain. And the costumes! So much velvet and pleating and other lush textures that you can practically feel through the screen. A lot of love went into this movie, and it shows. The plot propping up all that beauty is a simple thing. If you've seen the Crimson Peak trailer, you can probably guess at most of what is going to happen. That was fine with me. This is a Gothic romance, a genre that lives and breaths tropes. I enjoy seeing such lurid and silly material being thrown on screen with a budget of millions of dollars. I think any other fan of the genre will enjoy it too, if only to catch nods to luminaries of the genre, like quotes from Jane Eyre (being said by Tom Hiddleston). The cast is well suited to the material. With a dye job, Jessica Chastain and Tom Hiddleston look impressively like siblings, all high cheekbones and light blue eyes. Chastain's performance has been thoroughly praised (as it should be), but I think Hiddleston acquits himself well as a man who has lived in the thrall of his sister his entire life. I quite liked Mia Wasikowska as Edith, too. She's an actor who didn't leave much of an impression on me until Stoker, and I've come around on her. It doesn't hurt that she's playing a bespectacled author who is willing to wield a shovel when times call for it. The only bum note in the cast is Charlie Hunnam's American accent. I didn't even realize he was supposed to be an American and not an immigrant until I remembered that his mother and sister were clearly American. He was quite good as the childhood friend who suspects shenanigans, but that accent was possibly the most shocking thing in Crimson Peak. Crimson Peak was a wonderful way to spend an October afternoon. It has a few chills, a snowy backdrop, a surprisingly effective love story, and plenty of mayhem. Plus, it is absolutely gorgeous. Thanks for sharing. I wasn't sure about this one, but I'm really curious now. I love Tom Hiddleston and want to see him in more - he's a fantastic actor. He's quite good in this.